45,097 people have signed. Help us reach 50,000 signatures. Yesterday, despite protestors best attempts to sabatoge our tour, the #FreeSpeechBus made its final stop in Washington, D.C.
As we reflect back on the tour, it is clear that the #FreeSpeechBus highlighted the vicious intolerance shown to anyone who expresses dissent regarding the transgender agenda. Gender ideology advocates made it clear that they will stop at nothing to silence those who support the message of the #FreeSpeechBus. 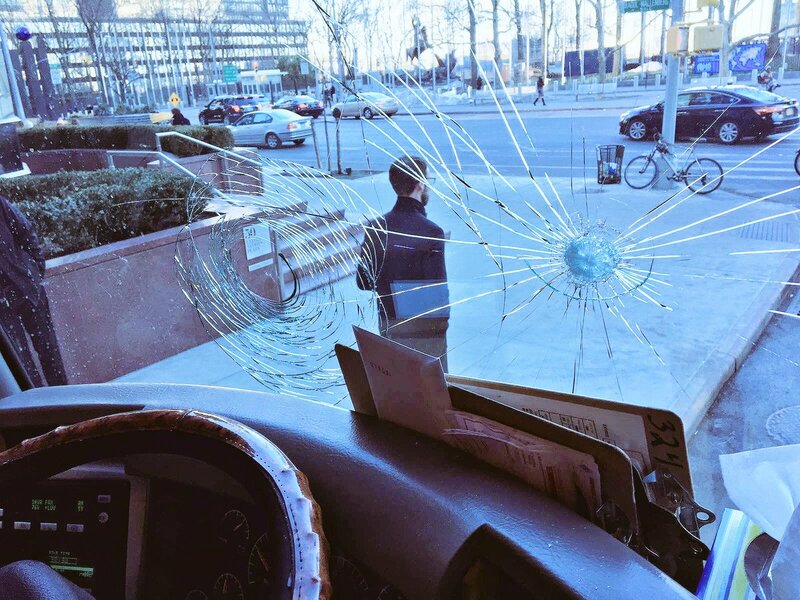 The day after it was launched (as described below), the bus was attacked in front of the United Nations by three individuals who smashed six windows with a hammer, spray-painted the outside, and keyed the exterior. When the bus driver attempted to stop their attack, they assaulted and injured him. After repairs were made to the bus, we continued our tour to Massachusetts. There, intolerant protesters again used violent and illegal methods to silence the message of the bus. At Harvard, a group broke a tail light, vandalized the bus with a sharpie message, and keyed the exterior. 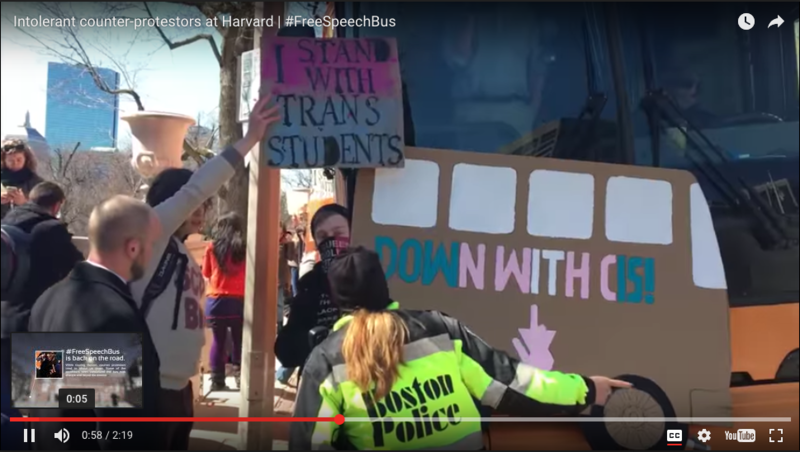 In Boston, protesters stood in front of the bus, not allowing it to move through traffic. Another protester threw hot coffee inside the bus on the bus driver. Click below to watch a video with clips showing the violence and intolerance we experienced in Boston (WARNING: language). The next day, the bus visited New Haven, Connecticut. Towards the end of the day, one of our representatives got out of the bus to take photos. When he wasn't looking, he was attacked from behind and punched repeatedly by a protester. In Philadelphia, the mayor's “Office of LGBT Affairs” proudly referred to themselves as “an accomplice” in organizing protests against the bus. These protests quickly turned violent, with gay activists and anarchists attacking the bus and the police officers who were trying to maintain order. At least one of the protestors was arrested, and bus organizers were prevented from speaking freely to the press. The Mayor’s office took pride in this act of intolerant bullying. The same individuals and groups who want to fly the flag of tolerance and acceptance are far from tolerant when it comes to dissenting views. This is their response when someone says something so commonsensical as: boys are boys and girls are girls. All we ask for is respect for our views and the opportunity to voice them in accordance with the First Amendment. The attacks on the #FreeSpeechBus show that intolerance and hatred against those who disagree with gender ideology dogmas is increasing in the United States and worldwide. As a consequence, the fight for liberty, freedom of religion, and freedom of speech is more urgent than ever. Our #FreeSpeechBus was just attacked and vandalized right in front of the United Nations in New York City. Our bus driver received minor injuries during the incident. Police will pull video from nearby surveillance. This is a hate crime, and sadly the way that those who pretend to preach "tolerance" feel about opposing viewpoints. There will be some major costs to get the bus back on the road in a timely manner. We are liable for the bus and safety of the bus driver. Please help us get the bus back on the road by the road this weekend with a small donation of $10, $15, or $20. To donate please go to https://donate.citizengo.org/en/. 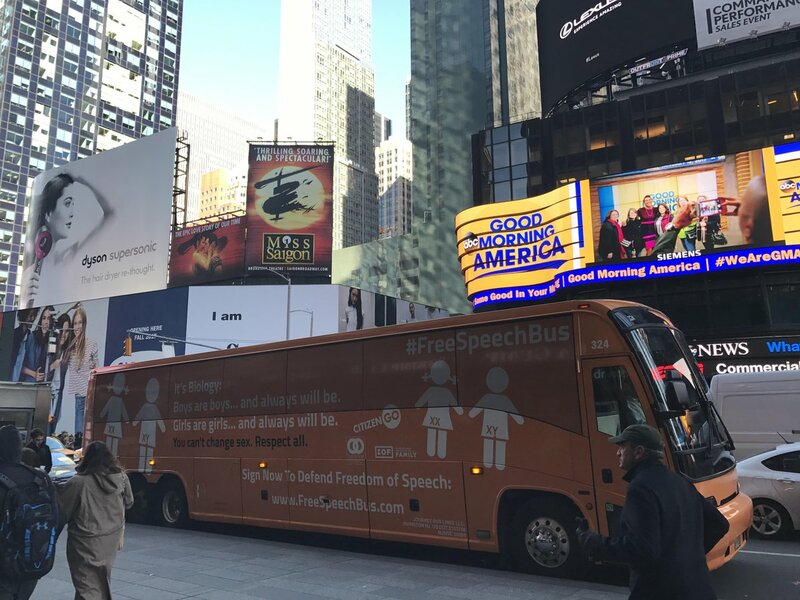 Update March 22, 2017: The #FreeSpeechBus is rolling through Manhattan today, with stops at Times Square, Trump Tower, the United Nations, and the Stonewall Inn. We are sharing a message of free speech, and the right of parents to refuse the indoctrination of gender ideology in schools! 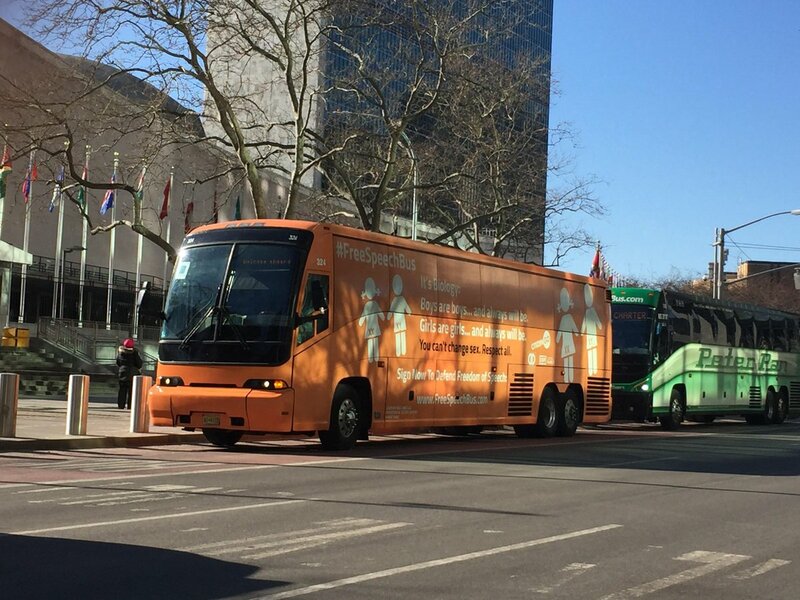 This week CitizenGO is launching the #FreeSpeechBus in the United States! If you agree with the biological reality that boys are boys and girls are girls, please sign this petition to support the #FreeSpeechBus. Here's what the bus will look like... We'll update this petition page with photos of the bus when it launches on Wednesday! The bus will be making stops in New York City, New Haven, Boston, Philadelphia, and Washington. We hope to extend this campaign to more cities in the future. As the bus tours each city, we will host local rallies and press conferences. We've already experienced a massive backlash after a similar bus was launched a few weeks ago by our sister organization in Spain, HazteOir. Our website was even shut down for about 24 hours after we experienced a Denial of Service attack from an extreme pro-LGBT hacker group. In response to this pamphlet, CitizenGO launched an informational campaign, which includes the buses, to warn against this gender indoctrination. We don't know what the response to the #FreeSpeechBus will be in the US, but we expect that radical gender ideologues may try to get our bus shut down. Please sign this petition to show your support for the #FreeSpeechBus. Whatever happens over the next few days, we will not give into the pressure to stop this important campaign. We will continue fighting for our values around the globe. We will keep you updated on this webpage and via email as the situation continues to unfold during the bus launch in the United States. Thank you for signing this petition and sharing it with your friends. This campaign is only possible because of your donations and support! It is a biological reality that "Boys are boys... and always will be," and "Girls are girls... and always will be." I urge government officials federally and locally to support the right of the CitizenGO group to circulate this important message during the #FreeSpeechBus campaign.